The office of Alvaro Siza is located in a five-story building overlooking the Douro River in Porto, between the historical center and the Atlantic ocean. In the 19th century this was a small fishing village on the outskirts of the city, and in many ways the place still retains its character, with boats moored in the harbor, fish being sold on the streets, and a ferry crossing the river every few minutes to the neighboring village of Afurada. In plan, the building is a U-shape, opening to the south. It occupies the center of the lot and maintains the setbacks required by local building codes. The first floor, which was initially intended for commercial purposes, is partially underground and covers almost the entire site. It receives light and ventilation from Rua do Aleixo and via two patios which are at the same level as the interior spaces. The service facilities and the stairs, which provide access to all levels and a roof terrace, are located on the northern side of the building. 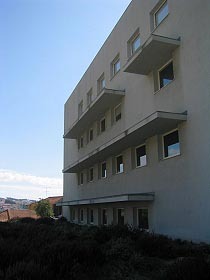 Siza shares the Aleixo office building with several other architects, who also contributed to its design. The basement floor has been partially given over to the archive, while the terrace was intended to house a cafe. Each floor, with space for 25 or 30 people, is occupied by either one or two offices, and apparently the somewhat random configuration of window openings is a result of each of the architect's needs. The1.30 x 1.80m pivoting windows, sheltered on the eastern facade by horizontal concrete awnings, provide carefully framed views of the surrounding landscape - the steep hillside to the east, the river Douro and the old city center beyond. The soft light produced in the interior, the constant presence of water, and the building's dominant position in the neighborhood, which helps to cut out the noise of people and traffic below, create a peaceful working atmosphere in the office. The building structure is in reinforced concrete, its outer walls covered with polystyrene foam insulation and treated with an application of ash-colored stucco. The materials in the interior include white stucco, wood furniture and window frames, linoleum flooring, and marble floors and tile in the wet areas and stairwell. 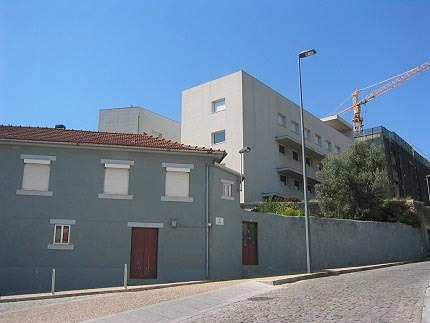 The office of Alvaro Siza and others is on Rua do Aleixo, 5km west of the center of Porto. The easiest way to find the building is to drive or take the tram or buses 1 or 24 along the riverside Rua do Ouro, also known as the Marginal, in the direction of the ocean. Approximately 800m after passing the Ponte da Arrabida bridge, and just after the several boat-restaurants on the river Douro, there will be a plaza on the right-hand side, with a playground and cafes around its perimeter. From here the building will already be visible. Turn right at the plaza on Calçada do Ouro, and go up 300m away from the river. Alternatively, it is possible to take Avenida da Boavista or Campo Alegre Street and then descend to the river. A site showing detailed bus routes and schedules is at www.stcp.pt. An excellent interactive map of the city, where it is possible to search by street name is at www.cm-porto.pt/. Click on 'Mapa da Cidade do Porto' usually in the right-hand column of the page. It is generally possible to visit the office on any day of the week, preferably near the end of the working day (6-8 pm) or on the weekend. If you are coming with a large group, please call ahead: +351-22-616-7270 or fax +351-22-616-7279.